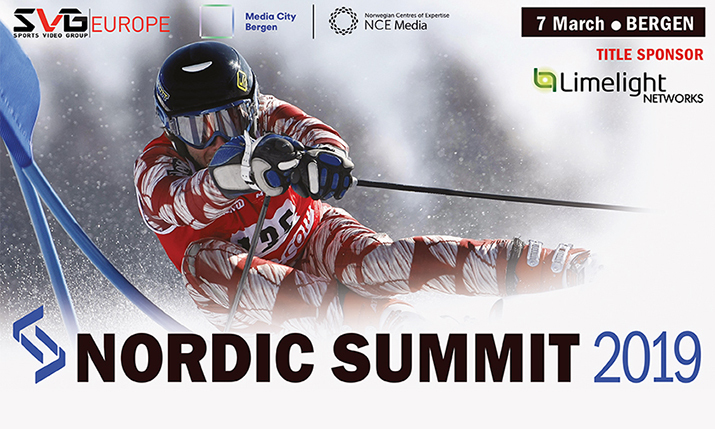 Alpine skiing, handball and biathlon will be among the sports being discussed in March when SVG Europe returns to Media City Bergen for the Nordic Summit 2019, sponsored by Limelight Networks. Reflecting the wide variety of different sports played across the region, the event will place particular emphasis on providing real-world examples of how broadcasters and their technology partners are collaborating to improve efficiency, increase productivity and ensure that sports fans get the possible viewing experience. In this session, technical producer Madelen Ottosson will discuss how Swedish Television (SVT) developed new workflows to ensure that it could capture the action from the FIS Alpine World Ski Championships, the Vasaloppet and the Biathlon World Championships all within the space of a few weeks. In a special showcase session, NRK Beta’s strategic advisor and the Media Cluster’s chief nerd Eirik Solheim will highlight some of the experimental broadcast technology being developed by NRK, from man-carried studios to airborne cameras. The conference programme will also include sessions on video-over-IP, live streaming and 5G. As with all SVG Europe events, there will be ample networking opportunities including one that is taking place on the night before the Summit, on the evening of Wednesday 6 March. Nordic Summit 2019, produced in association with NCE Media and Media City Bergen, will take place on 7 March 2019.